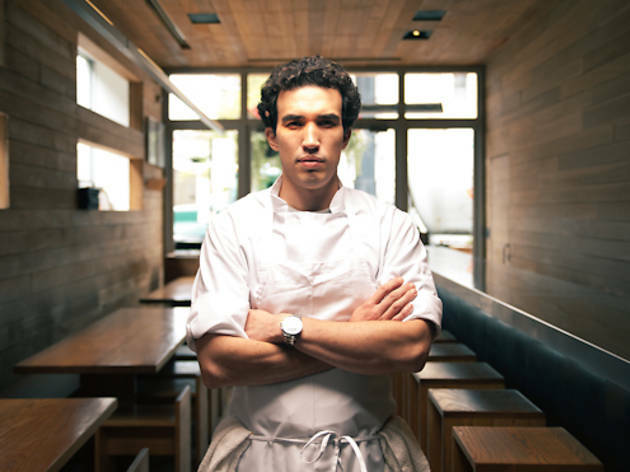 Erling Wu-Bower, 29, was named chef de cuisine of Avec in late August, shortly after Koren Grieveson and One-Off Hospitality parted ways. The chef, who put in years as an executive sous chef at the Publican and Publican Quality Meats, has been keeping his head down—and not talking to the press—ever since. But earlier this week he took an hour to drink some tea, eat some cookies and tell me about the challenges of taking over a well-loved menu. This is a lightly edited but still rambling version of our interview, which was Wu-Bower's first with the press since moving into his new role; a shorter version will run in the magazine in our October 18 issue. So we’re in week three now? Week four, to the day. Has taking on Avec been a career goal for you? Was it a goal? Avec is my favorite restaurant in the city. And I think that it’s a great honor that they came to me. It’s very rare that a chef gets to come back to where they started, and where I started is literally—I come here to eat more than any restaurant in the city. I mean there’s maybe two or three other restaurants. I love this place. I really care about this place. I’ve cared about this place as a customer. I‘ve cared about this place as a cook. [Wu-Bower worked under Grieveson at Avec in 2005.] The chance to come back is exciting and more than anything, it’s an honor that they would ask me to come. Were you surprised when they asked you? Yeah, certainly, I was certainly surprised. Describe that conversation for me. Paul came up to me and he was like, you know, Koren and us decided to go different ways, it was an amicable split, we wish the best for her and I’m sure you do, too. But we’ve thought about who would be best to fill her shoes and we think it’s going to be you. And you said, Oh, let me think about it? Was it scary to think about taking over Avec? Absolutely. It was terrifying. I mean, it’s my first chef’s job and that’s imposing as it is. I think one of the things you don’t think about when you’re a sous chef is what it’s going to feel like to be a chef. You think you know what it’s going to be like to be a chef, but you have no idea…. That’s why I was nervous, you know? What have been some of the things that have been unexpected? It’s a two-part thing. When you’re a cook or a sous chef and you see somebody eating your food—and all these restaurants have wide open kitchens—there is a level of removal. And that level of removal is actually one person [the chef de cuisine]. And when you lose that level of removal, it’s terrifying. [Now,] it’s you. This is yours. Also, here it’s compounded by the fact that we’re doing it two-and-a-half feet way from you. We’re like six inches away from you! So you turn around and somebody’s eating their food a little slow, or somebody didn’t finish their food, and you’re like “Oh, what’s wrong?” That’s one of the things. You mentioned that Avec is one of your favorite restaurants, and I think a lot of people—not just chefs—have really strong relationships with this restaurant. Did any of your anxiety surround making changes to this place that so many people love? I mean, I heard dates and foccacia like five thousand times. Which was crazy because while I was here, nobody could understand how I could eat dates every single day. Every single day they come out of the oven—George [a prep cook] par-cooks them on a sheet tray and when they come out—I don’t like my bacon crispy, I like it soggy—and when they come out they’re like soggy bacon dates, and it’s the best thing on earth. So there was no worry that [I’d take them off the menu]. But yes, the worry was, how can you change things but not change the heart and soul of the place? It’s easy because I worked here and it's easy because Koren was my first chef and she taught me so much about how to be as a cook, and as a chef, but also how to cook. Have you thought of any philosophical changes you might want to make to the menu? No, no. The philosophy of Avec is the philosophy of Avec, period. It’s Mediterranean. I walk in this place and I see the wine, I see the cheese and it’s Mediterranean rim…that’s what it brings to mind in me. I’m a firm believer that the best food comes out of a firm focus, a geographic focus. I think it can be more focused once you focus on one geographic area. So we’re going to try to refocus on the Mediterranean rim. And what I mean by that is southern Spain, southern Italy, a little bit of Greece. Turkey’s there, Nice is there, Morocco’s there. It’s just a refocusing. There is no philosophical change at all. And to be honest with you, some of the first dishes I put on the menu were dishes that were literally right out of Koren’s playbook. How literally out of her playbook? Things that she taught me with a little bit of tweaks of mine. What was the first thing you put on? The first menu change was five items. It was a tomato salad, it was a salmon dish, which has since actually changed already. It was a sweetbread dish. A pasta dish. And then two salumi dishes. One of the major things we’ve done is we no longer just do the salami plate, we do salami dishes. [Wu-Bower points to a new section on the menu titled Salumi Plates] They’re small plates. Take me through putting this new section on the menu. Is this something you’ve long fantasized about doing once you got an executive chef job? One of the great things about this company—and the reason why I’m still at this company—is they allow you your freedom as a cook…. I was in a great position to [put dishes on the menu at the Publican] because I spent most of my day conceptualizing and ordering and doing stuff like that. So did I fantasize about what I’d do on a Monday when I became an executive chef? No. I got to do it every day. Which is one of the reasons why I love it in this company. Also, this is actually something that Paul [Kahan] came up with…. I take no credit for this. I imagine people who have been working here a while must have had a real connection to Koren. Her departure must have shaken this place up beyond merely getting a new chef…. I think it was easy because Koren was a continuation of Paul, and I’m a continuation of both of them…. [When] I came in here for the first menu change, I was just like, look, I’m not here to reinvent the wheel, I’m not here to reconceptualize the place. Koren taught me a lot of stuff that I know, and I wish the best for her, but we’re going to make a few changes around here. And that’s what I see as being for the better of the place. Have you talked to Koren at all? Told her what you’re doing? Do you feel at all limited or constrained by Avec’s philosophy? Not at all. Am I constrained by the Mediterranean rim? Will I constrain the cooks to the Mediterranean rim? Will I encourage the wine and the cheese and all that to be Mediterranean? Absolutely. But that’s exciting to me. I think a lot of times with food, too often people are just grasping. Food has survived culture for a certain amount of time because it’s freakin’ good. Right? And so you should cook within cultural confines. When you dig deeper into culture, you find newer and brighter ideas. And taking ideas from different cultures and trying to mash them, smash them together—it doesn’t work for very good reason. You mentioned that some of these dishes are collaborations between you and Paul. I remember talking to Paul a couple years ago, and him laughing that people sometimes forget that he’s involved with Avec. How involved is he? So he’s not tasting every dish before it goes on the menu? Oh, he absolutely is. Every single thing. And he will very specifically criticize you, like: Man, that’s crap. And you think about it, like, you know, he’s right. 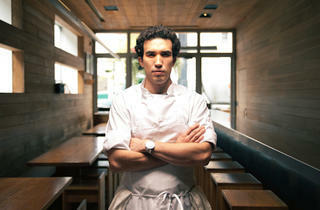 But he has very specific criticisms, like depth of flavor questions, and eatability questions. The stuff that he’s taught you to think about for years and just maybe needs to pound in your head. Tell me more about trying to get out of the Publican mind-set. How is the Avec mind-set different? Brian Huston [chef de cuisine at the Publican] runs a daily restaurant. I don’t know any other restaurant—maybe one or two—that I’ve ever seen that actually are a daily restaurant. There’s not as much change here. I have this menu and it doesn’t change from day to day. Avec dishes need to meet a very, very different standard in that they need to be geographically focused, but they also need to be usable on a day-in, day-out basis. For example, I would really like to use West Coast skate wing, which is some of the best fish I’ve ever had. They kind of catch it every now and again and when they have it, they send it to us. At the Publican, that just goes on the menu, right? Because it can go on the menu one day and tomorrow when they redo the menu it can be gone. But at Avec, you can’t do that. When I say complete thoughts, I’m not saying the Publican dishes aren’t complete thoughts. But it’s a more free-flowing concept than this is. I also wonder if plates at the Publican have less elements than the plates at Avec. Some yes, some no. I am trying to be as simple as possible here. And it’s hard. There’s a lot of stuff on a lot of these plates. But where I can remove, I’m going to. When Paul tastes, is he more likely to want to add something or take something away? So, four weeks in, are you still as terrified as you were in the beginning? How much has that fear faded? Not much. That’s a good thing for the food here. It keeps me on my toes. Food has kept me awake for 20 years. What about it keeps you awake? Something went out the way you didn’t want it? All of the above. Will I have this ingredient long enough? I really want to do lima beans with this salmon. How am I going to have lima beans? They only run for another two weeks…. But isn’t there a sort of relief, a sort of freedom, in finally being the boss? Is there relief? No. I feel no relief whatsoever. I feel a double amount of pressure, to be honest with you. I want to improve everything, I want every dish to be a dish that somebody goes home and remembers. And it’s just not possible. But that’s the perfection that I drive myself to. There’s no sigh of relief.